We still mislabel cancer. Calling an illness “prostate cancer” or “breast cancer” doesn’t get to the core of the problem. That classification system—using organs and parts of bodies—is far too broad. Even categorizing cancers based on specific cell type within an organ, bone or muscle, such as the lining of the kidney, isn’t enough. The truth is that cancer cells are more genetically unique than that and are driven by the genetic mutations they carry. And that determines the course of treatment a patient will undergo. For example, non-small cell lung cancer cells have one of three known mutation types, or some combination of them, with each responding differently to drugs. To figure out what mutations are present in cancer cells, doctors often rely on a genetic analysis of the tumor, by way of a biopsy. However, the biopsy procedure can be difficult for a patient, especially if the tumor is in the bone. In some cancers—leukemia for example—tumors rarely form, so a biopsy is impossible. Furthermore, a biopsy seldom reveals the diversity of mutations that exist within or among tumors nor how they can genetically evolve as a result of treatments. But a revolutionary new blood test could replace or complement biopsies for this type of diagnostic procedure, and make cancer treatment substantially more precise. The little device, called the CTC-iChip, is a microfluidic device, the first of its kind to filter out tens of billions of blood cells from tumor cells from a blood sample for genetic analysis and monitoring of cancer. It’s simple and effective: As a blood sample enters the CD sized device, magnetic beads coated with antibodies attach to the white blood cells. Red blood cells, platelets, and other smaller particles are then filtered out, while remaining cells, including circulating tumor cells (the “CTCs” in CTC-iChip), pass through a magnetic field separating out the beaded white cells from the rest. What ultimately remains is a purified solution of circulating tumor cells, which can be easily tested. Dr. Mehmet Toner, the Harvard Medical School-based designer of the CTC-iChip, calls the test “a liquid biopsy.” It not only sets the stage for precise, less toxic drugs by isolating only those mutations that are causing the cancer, he says, but it does so in “real time” by highlighting drug resistant mutations that often emerge during treatment. In lab tests, the CTC-iChip is being used to catalog the vast constellation of genetic aberrations that lead to cancer, and it provides real hope in outwitting this dreadful disease. Correction: This article originally did not describe the most updated CTC-iChip design. 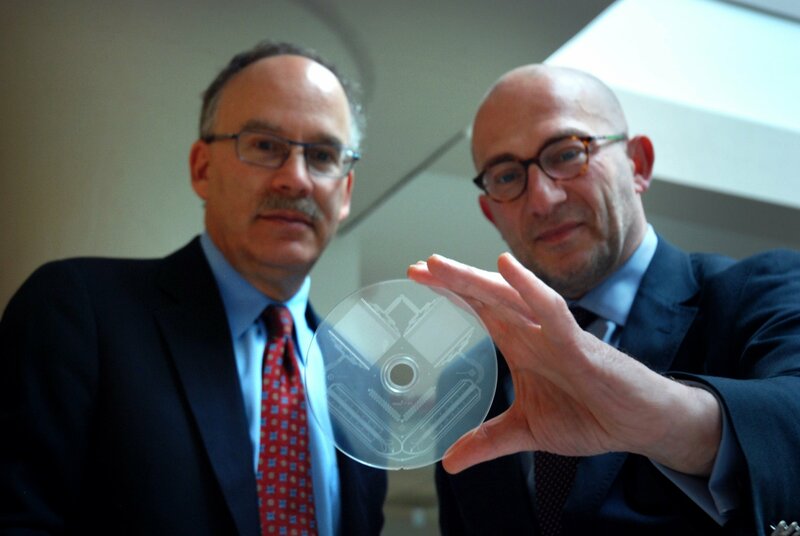 The most recent design is a microfluidic CD-sized disk. The primary image on the article was also updated to reflect the most recent design.